CE505A MICR - HP 2035 MICR Toner - P2055 MICR - For use in HP LaserJet P2035, P2035N, P2050, P2055, P2055D, P2055DN, P2055X, 2035, 2055, Troy MICR 2035, 2055 Printers. Page Yield: 2,300 @ 5% coverage. Premium New HP cartridge modified with MICR Toner. For use in HP LaserJet P2035, P2035N, P2050, P2055, P2055D, P2055DN, P2055X, 2035, 2055 Printers. Page Yield: 2,300 @ 5% coverage. 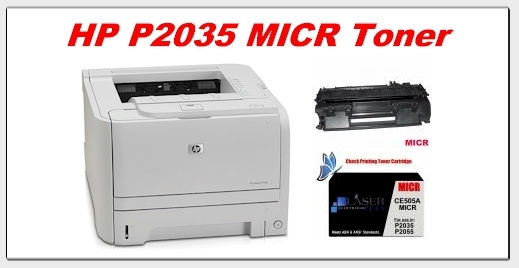 You have found the best source of * HP P2035 MICR Toner * for use in all HP LaserJet P2035 and P2055 Printers.